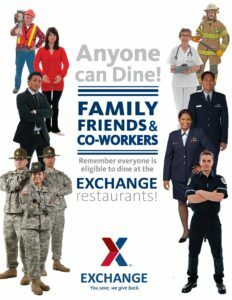 GRAFENWOEHR, Germany — The Army & Air Force Exchange Service is offering a warm welcome — and a bite to eat — to visitors, Department of Defense contractors and civilians at Exchange restaurants. The Grafenwoehr Exchange’s quick-serve restaurants are open for anyone with installation access to dine-in or pick up grab-and-go fare as long as the items are consumed on the installation. All of the Grafenwoehr Exchange’s restaurants offer better-for-you menu choices featuring reduced-calorie entrees. The Grafenwoehr Exchange carries BE FIT-approved items, including fresh fruit, yogurt, hard-boiled eggs, nuts, bottled water and more. ‘Healthier Choices, Healthier Lifestyle’ shelf tags easily identify these items at Express locations. Guidelines on who is authorized to use Grafenwoehr Exchange operations are prescribed by Army Regulation 215-8 and the Armed Services Exchange Regulations, Department of Defense Instruction 1330.21. Visit the Exchange’s Facebook, Twitter and Instagram pages.